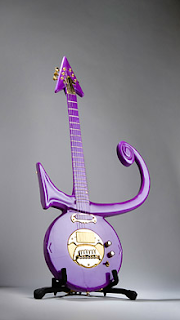 This purple version was played at the halftime show of the 2007 Super Bowl and is currently on exhibit in the four year traveling America I AM: The African American Imprint exhibition. The original gold love symbol guitar was built by German luthier Jerry Auerswald in 1993. The American branch of Schecter guitars made copies of this design in a variety of colors in 1996.